This piece was many years in the making. I had been using styrofoam for quite a while and had always been fascinated by the industrial text that seemed to highlight many of my concerns in a very concrete way. The text includes ideas/words such as: insulation; safety; square edge; follow instructions; proper; hazard, brand names. 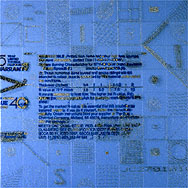 In this piece, I decided to use the pins to highlight or obscure certain sections of the text. In addition, I decided to challenge myself by scoring the entire square into smaller squares, creating a three dimensional undulating backdrop of pinned shapes and designs. 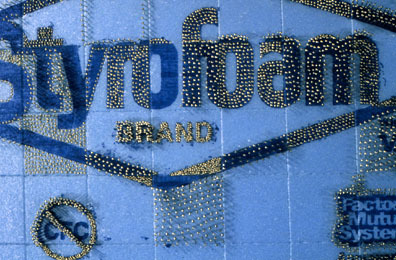 I began working with pins on styrofoam about six years ago for a number of reasons. I trained as a painter but was experimenting with other materials when I stumbled upon some industrial styrofoam. At first I used it as a canvas, attaching fabrics to it and the best way to adhere the fabrics to the material was by using pins. It didn't take long for me to unmask the styrofoam and start using the exposed material by itself. This material addresses many of the ideas I am interested in and does it in very subtle yet powerful ways. 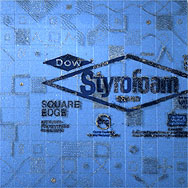 Styrofoam is commonly used as housing insulation to protect ourselves from the elements. I am interested in playing with notions of safety by sticking pins into it and putting what is usually inside of the wall, outside. The materials themselves attracted me formally - the insulation for its texture and its color, blue and pink - its gender associations, and for the industrial text that is marked on it. The pins I like to use for their shiny, glittery glistening qualities, for their ties to women's work and for their abilities to prick or pin down cetain words, phrases, ideas. I enjoy breaking things down into their inherent qualities in order to build something new out of them, to see common materials in different ways, loading the lightweight with meaning.